For eight years, Craig Boyer was a senior executive at Callidus Capital, and by the time he quit in 2016 he was its chief underwriter and vice president. But last year Boyer sued Callidus for CA$100,000 in damages, claiming the company had denied him health and other benefits and seeking the return of his stock options. 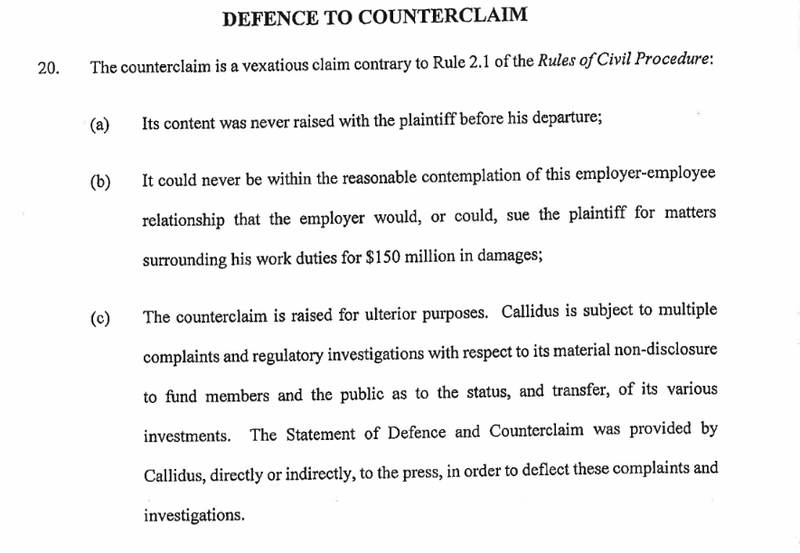 Boyer’s portrait of Callidus as a “poisoned” workplace, whose management style focuses on the “berating and belittling” of employees, is not an isolated one: Two former employees of Callidus’ parent company, Catalyst, have alleged in court filings that they had witnessed numerous instances of Glassman being emotionally or verbally abusive to his colleagues. Yet Callidus, in a statement of defense and counterclaim, has denied Boyer’s allegations of a poisoned work environment, saying he never raised such issues while working at the company. The statement also said, “all of Callidus’ employees are treated fairly and with dignity.” In fact, Callidus claimed that Boyer had developed a reputation of being difficult with employees who reported to him. 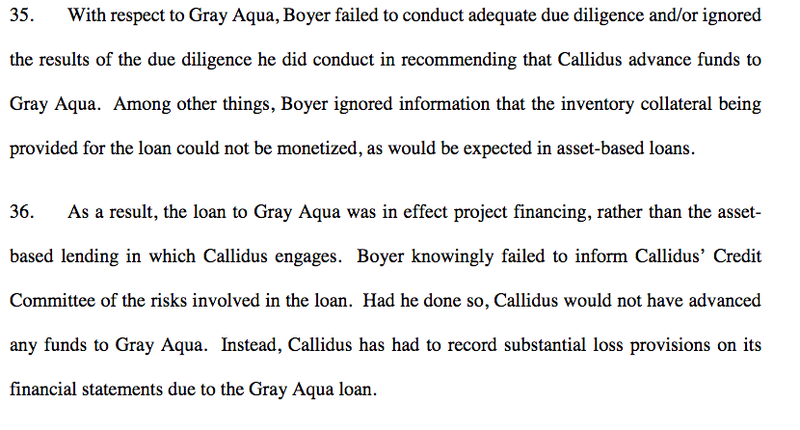 Moreover, Callidus struck back with a CA$150 million counterclaim, accusing Boyer of being incompetent in “failing to properly monitor loans in his portfolio.” Specifically, the counterclaim alleged that Boyer had failed to conduct proper due diligence on Gray Aqua, a fish farming company in eastern Canada, by ignoring the fact its fish stock could not be used as collateral. Plus, Callidus accused Boyer of encouraging another borrower, Xchange Technology Group, to “artificially inflate the results shown on their . 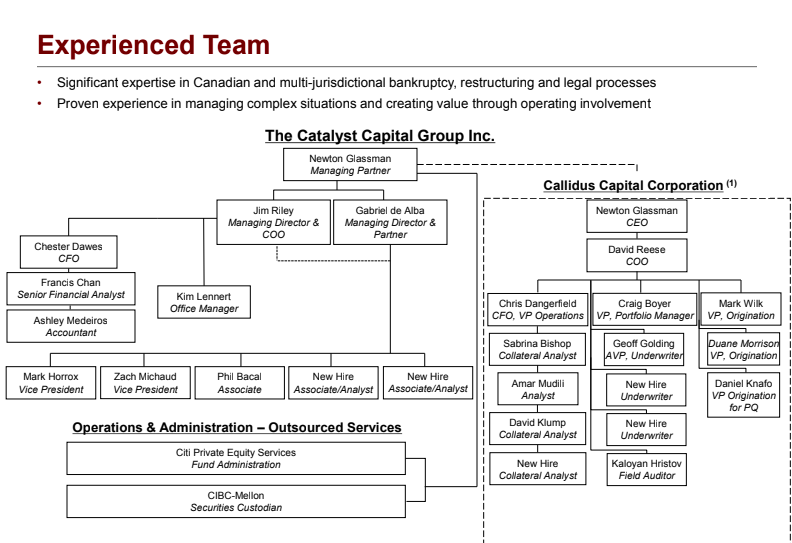 . . financial statements.” And Boyer did not inform Callidus’ credit committee that Xchange’s financial statements were “based on an artificially inflated before interest, taxes, depreciation and amortization, or EBIDTA,” according to Callidus. When these and other problems were brought to his attention, Callidus alleged, Boyer abruptly quit. In a reply and defense to the counterclaim, Boyer’s lawyers hit right back, saying he had no authority over others within the company. The lawyers asserted that Boyer had properly monitored the loans in his portfolio and it was his (unnamed) colleagues, after assuming oversight of his loan book, who had made mistakes, especially in Gray Aqua’s case. Boyer’s lawyers denied that he had pressured Xchange to artificially inflate the EBITDA figures. It was corporate skulduggery at its most audacious. Last September Frank Newbould dined at Scaramouche, a swanky downtown Toronto restaurant, with a businessman who said he would like to hire Newbould as an arbitrator. ANY UPDATE ON THIS STORY?